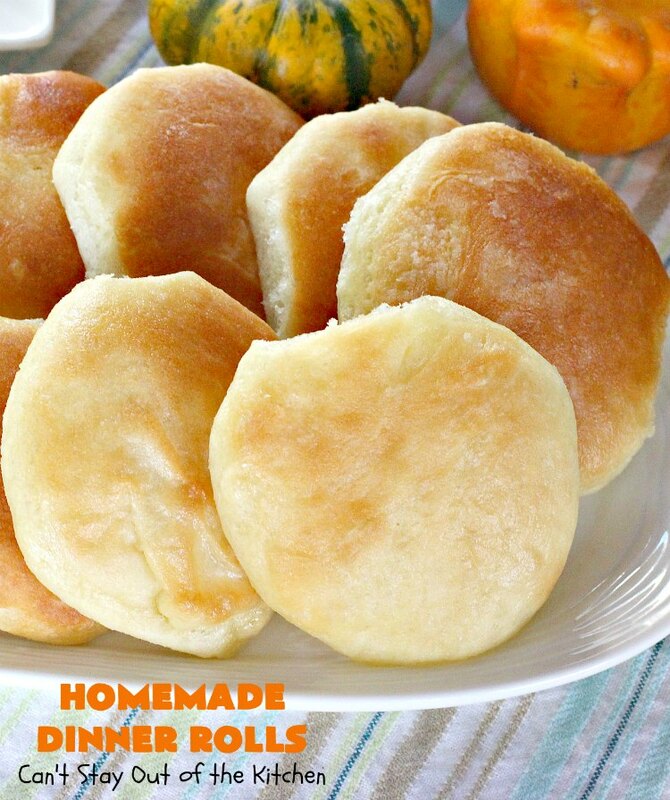 Homemade Dinner Rolls are awesome. I LOVE this no-knead Gooseberry Patch recipe for rolls! Any time you can make a homemade bread or roll without hand kneading, it is a wonder! This recipe is so, so E-A-S-Y!!! You stir together the ingredients, then put them in the refrigerator overnight. 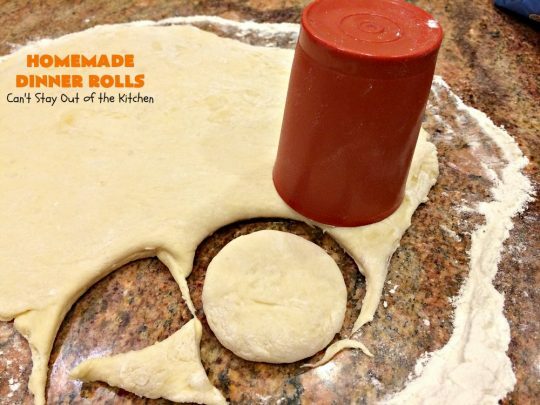 Then the next day you will see that the dough has expanded on its own and you roll it out and cut the rolls with a cookie cutter! 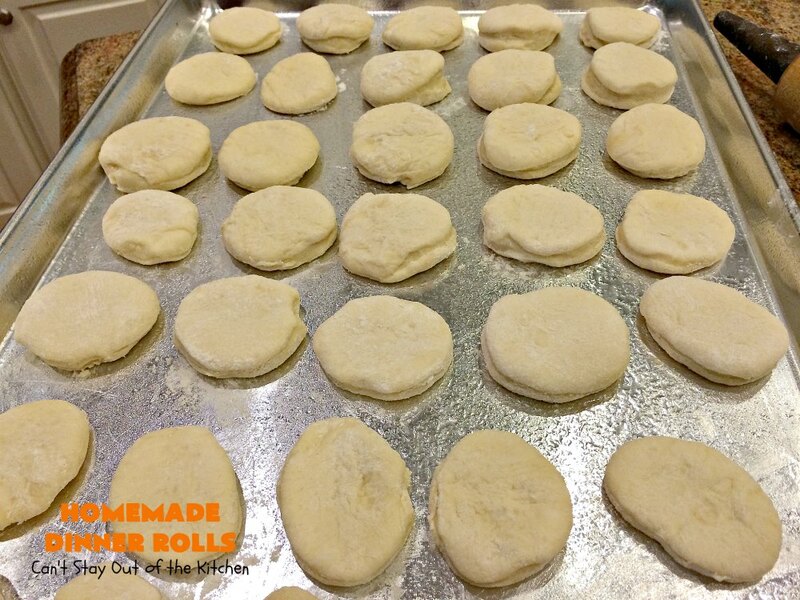 Place the rolls on a cookie sheet and put them in a warm place for an hour or two and then bake. Wonderful! I heated my oven for about two minutes and then turned off the heat and placed the rolls in the oven to raise. For a Homemade Dinner Roll, this recipe has to be the easiest and certainly one of the tastiest rolls I’ve ever made. 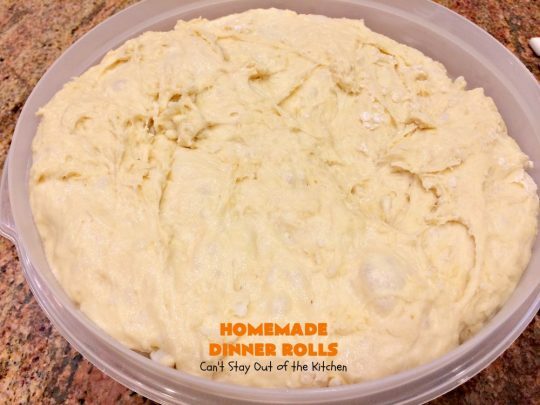 The first time I sampled one of these dinner rolls was a couple of weeks ago when some friends we had over for dinner brought a batch of these delicious rolls. 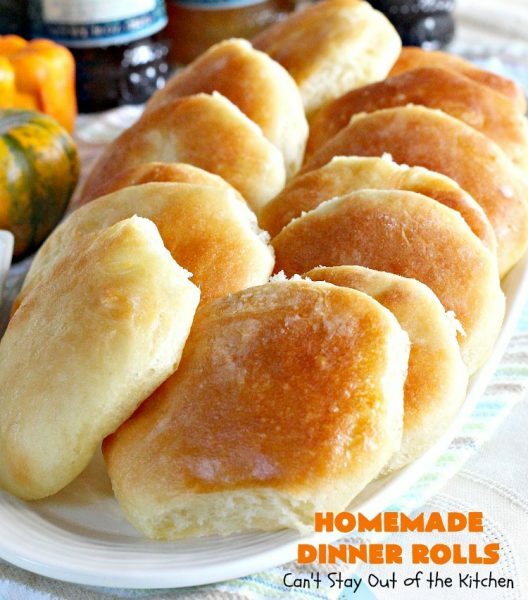 We had a couple of families for dinner that night and everyone LOVED the rolls! We served them with fig preserves and black raspberry jam and it was like eating dessert. Oh, my, these were so good. When our friend, Michelle, brought these spectacular dinner rolls she told me it was another Gooseberry Patch recipe and she had never even made it before! Not to be outdone, I have a copy of Country Cooking, too, so I whipped up a batch of these a few days later to take to someone who was in need of a meal and I reserved some for us! 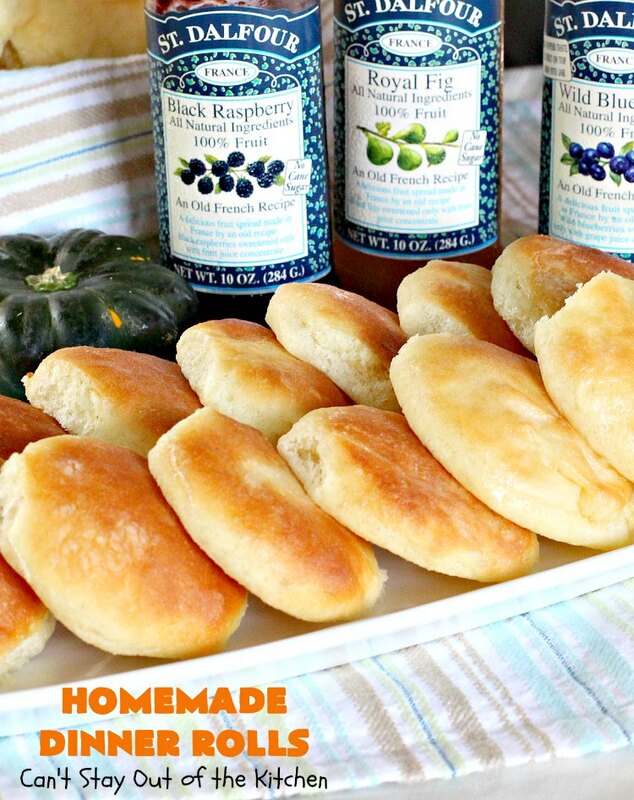 Yes, I pulled out the fig preserves again and wolfed down a few of these Homemade Dinner Rolls in very short order! 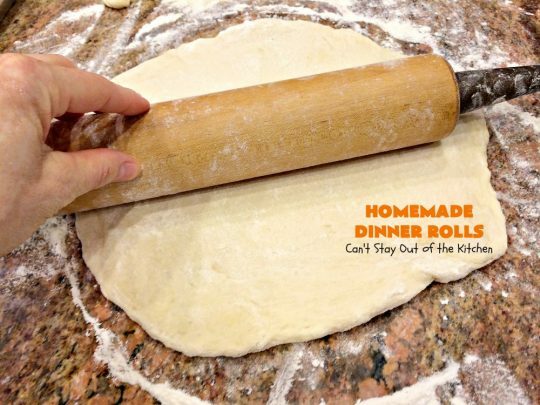 I offer a couple of recommendations when making this recipe: First, when you roll out the dough, make sure you don’t roll it out too thin like for pie crust. Roll it out about 1/2 to 1 inch in thickness for a better shaped roll instead of disks! Second, brush the tops of the rolls with melted butter once you put them on the cookie sheet, and again when you remove them from the oven. The first buttering prevents the rolls from sticking together when baking, the second allows the crusts to stay soft and not get too hardened or tough. Third, I used all the remaining scraps after cutting out the rolls and shaped them into biscuits too. They weren’t as pretty but they sure were tasty. [Drooling]. 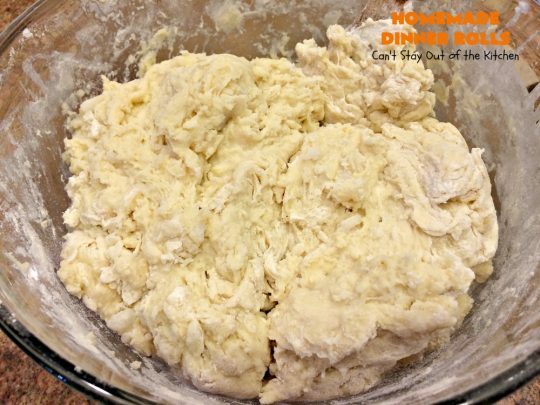 If you’re looking for a quick and easy way to make Homemade Dinner Rolls without all the fuss and mess of hand-kneading then you’ve got to consider this fantastic recipe. And it really is fantastic. 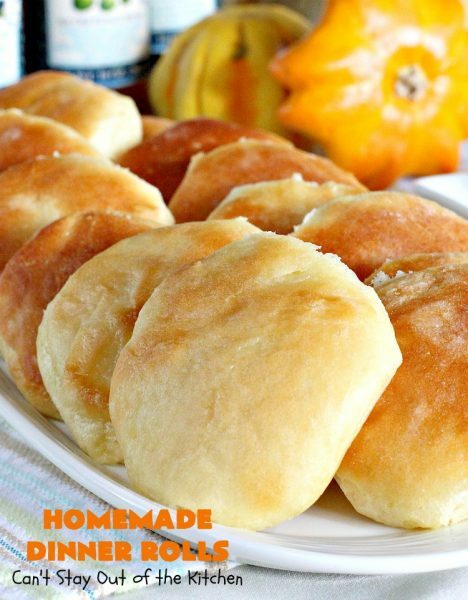 You’re family will be so thrilled when you offer them a plate of these rolls alongside a hot stew or chowder now that fall has arrived! 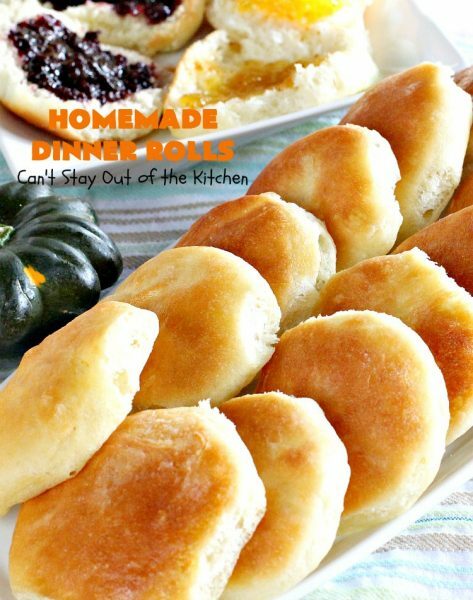 And you will be glad you gave these Homemade Dinner Rolls a chance. Yes, you will be so glad! 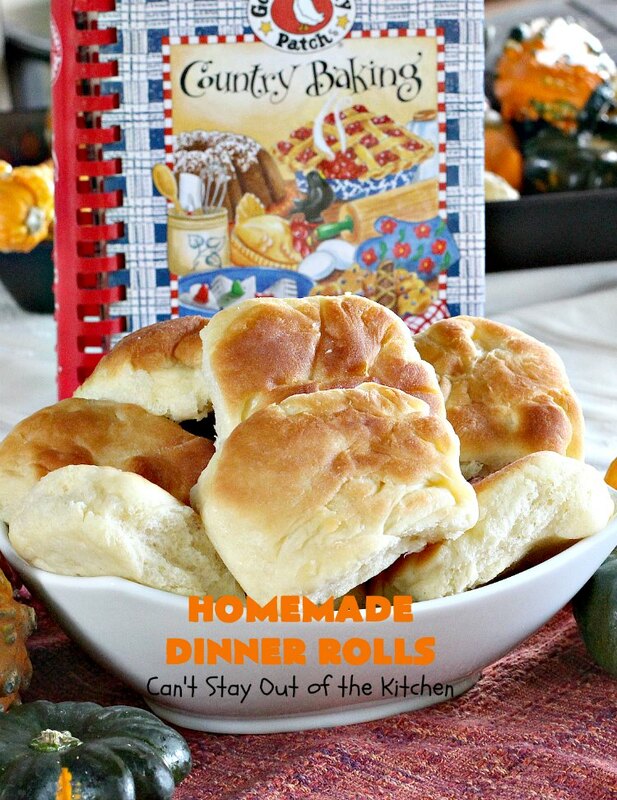 Homemade Dinner Rolls are a delectable treat your family will love for supper! Thank you, Gooseberry Patch for this fantastic recipe. The rolls above are the ones I made with the scraps of leftover dough. They’re not as pretty or fluffy, but they sure hit the spot! We love serving our rolls with jams and preserves. These jams from St. Dalfour are made without sugar and just rely on juice and berries to sweeten the jellies. They are spectacular as well as a healthy option. 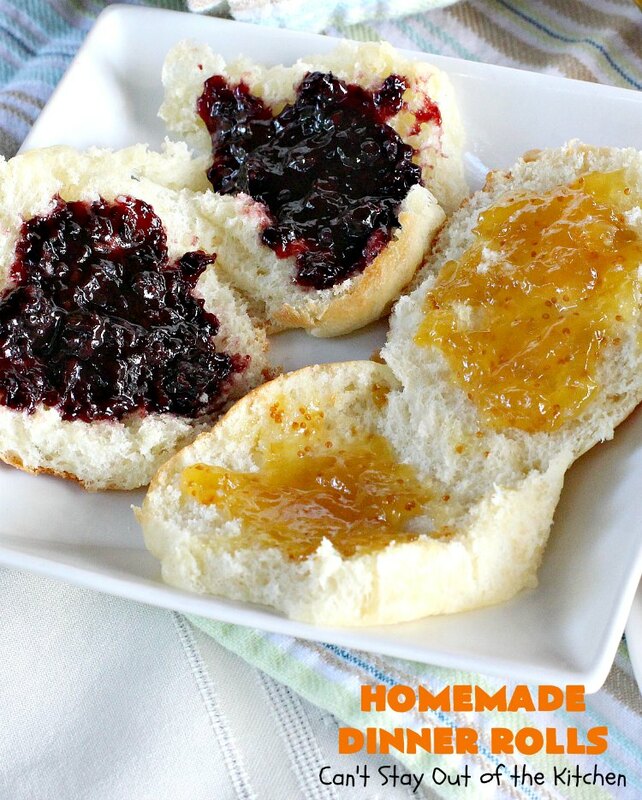 I can make a meal of just rolls with jelly! Black raspberry on the left and fig on the right. 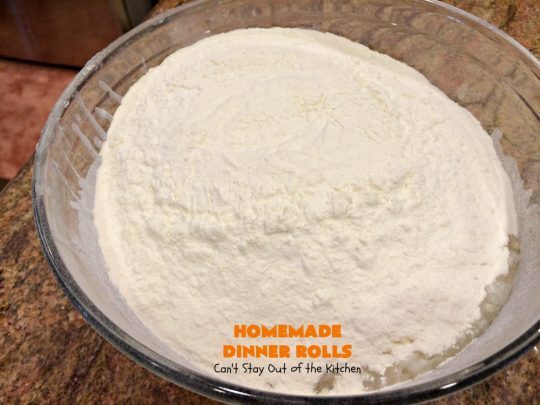 Homemade Dinner Rolls are so quick and easy to make since you don’t have to knead them. Yet you get that wonderful yeast taste as if you slaved in the kitchen for hours but without all that work! Place sugar in a mixing bowl. Add sea salt or kosher salt and Crisco shortening. One of these days I’ll get brave and try these with coconut oil or butter! Maybe next time! 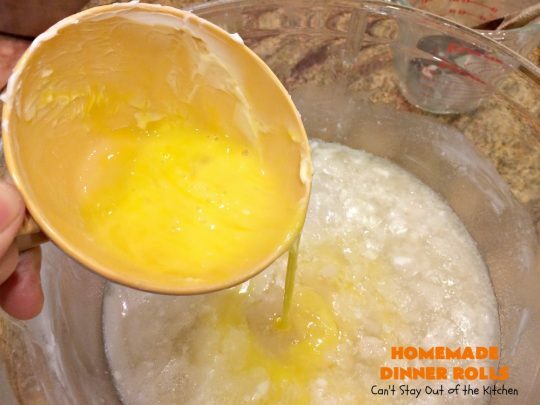 Pour boiling water over top of the ingredients in the mixing bowl and stir with a wooden spoon until the shortening dissolves. You may have to smash the shortening up against the edge of the bowl and rub it out a little to make the shortening dissolve. This will take some time – a few minutes, but finally it’s about ready. Measure out lukewarm water. This is really a misnomer. The water needs to be about 90-95 degrees or you won’t activate the yeast. Lukewarm temperatures are probably in the 70s or 80s and that low of a temperature won’t usually activate the yeast. Add yeast. Stir with a wooden spoon to dissolve. I was always told to use a wooden spoon rather than a metal spoon. Not sure if that’s an old wive’s tale or if there’s a legitimate reason. Possibly the metal will release chemicals that kill the yeast. 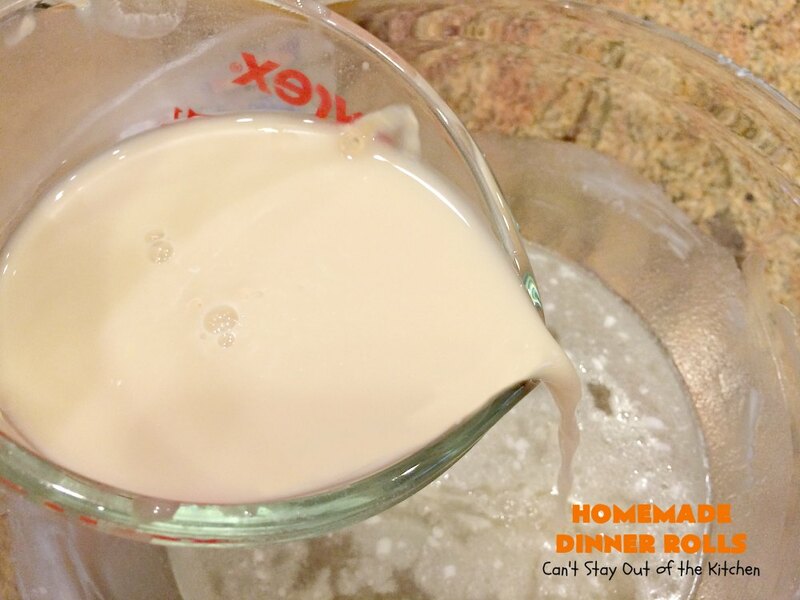 Add the dissolved yeast mixture into the mixing bowl. Add bread flour. Don’t use all-purpose flour as it doesn’t have enough gluten. It will also cause the bread to be more crumbly and dry out easier. Stir to combine. This will take a few minutes. 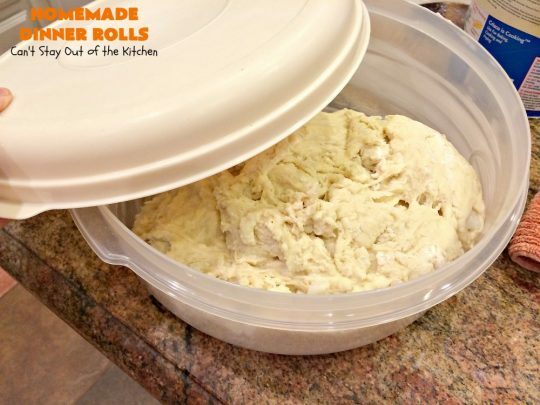 Place dough in a greased sealed container and refrigerate overnight. The dough rose to the top of the bowl overnight. Spread flour out on your counter top. Add the dough and place a lot of flour on top. Roll out dough with a rolling pin. Roll out to a thickness of 1 to 1 1/2 inches in width. (My dough should have been a little thicker). Using a cookie cutter or glass, cut out the dough and place on greased cookie sheets. Here are the rolls ready to raise in the oven again. I also made a pan of rolls from all the leftover scraps after cutting out the dough with the cookie cutter. They aren’t as pretty but they tasted just as good as the others. I would recommend that you brush the tops with butter before baking. Bake at 375 for 15-20 minutes. 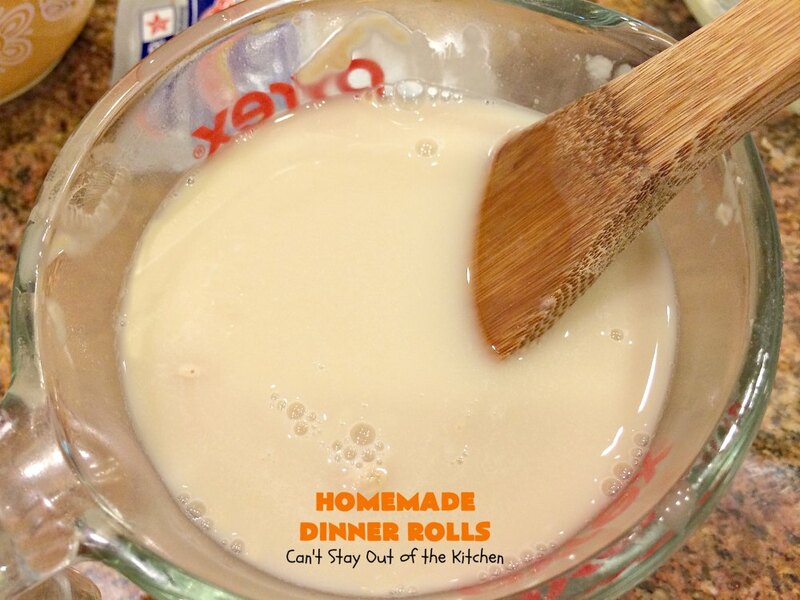 Keep an eye on these rolls as they tend to brown up really fast. Brush melted butter over the tops to prevent crusts from hardening. 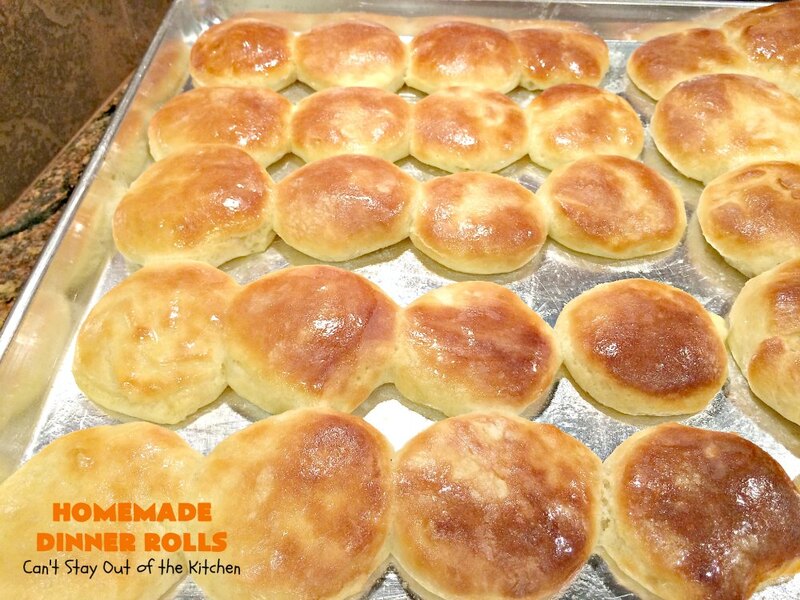 Here’s one of the batches of rolls fresh out of the oven. To serve: allow the rolls to cool a few minutes. Break rolls apart and place in baskets. Serve with your favorite jams, preserves, apple or peach butter if desired. We loved the taste of these Homemade Dinner Rolls and we, along with all of our company, raved over them. Homemade Dinner Rolls are one of the tastiest, easiest homemade roll recipes you’ll ever find! They are delicious served with apple butter, preserves, honey or jam. 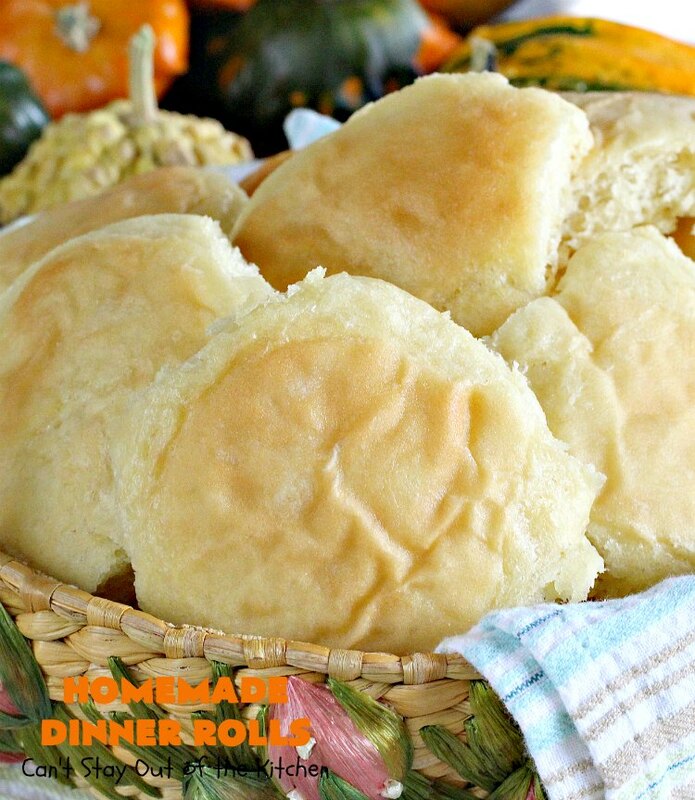 Homemade Dinner Rolls don't have to be kneaded! 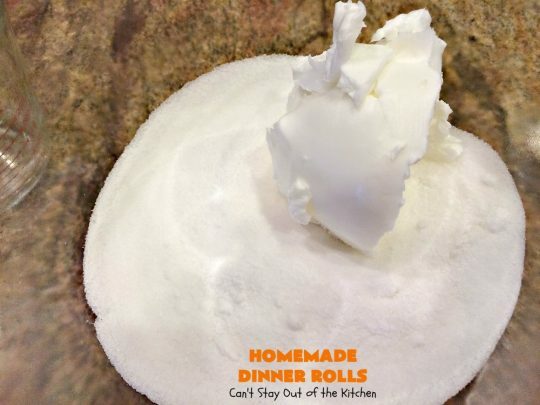 These rolls raise in the refrigerator. Roll out and place in a warm place and then bake! Amazing recipe that's perfect for holidays like Thanksgiving, Christmas or Easter! In medium bowl place sugar, shortening and salt. Pour boiling water over top and stir to dissolve shortening and mix ingredients together. 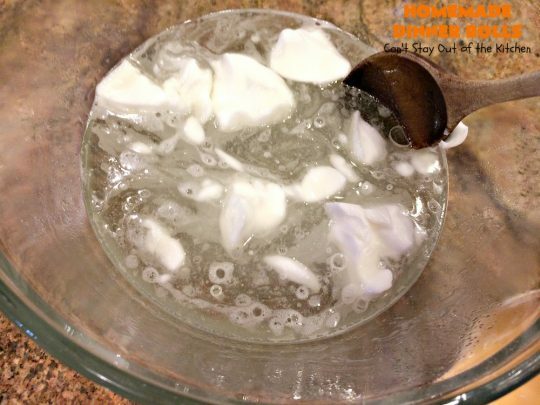 You may have to break up the shortening with a wooden spoon or press the shortening against the edge of the mixing bowl so it’s easier to dissolve. 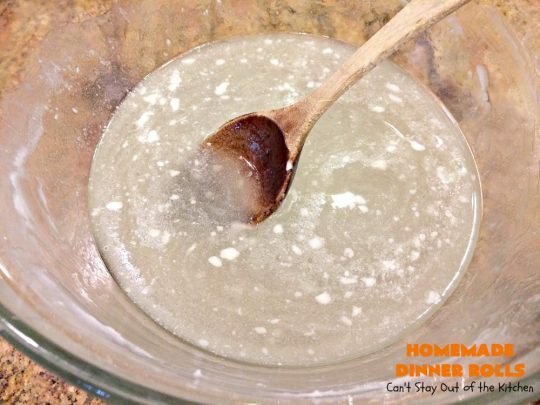 Dissolve yeast in a cup of water – about 90-95°. Stir with a wooden spoon until the yeast is totally dissolved. This, also, may take a few minutes. 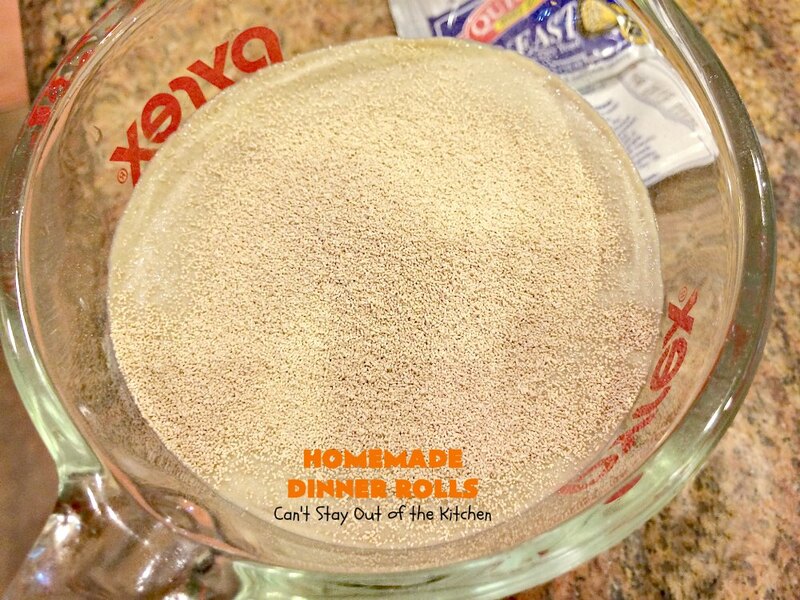 Add yeast-water mixture to other ingredients in the bowl. Add beaten eggs and bread flour and stir to combine. Transfer mixture to a lightly greased bowl. Cover bowl with lid and refrigerate dough overnight. On a lightly floured surface, roll out dough. 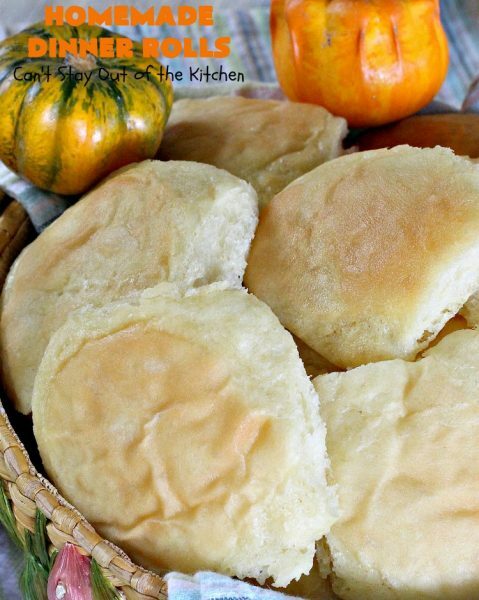 Cut the dough with a biscuit cutter and place rolls on well-greased cookie sheets or pans. Allow dough to raise in a warm place for one to two hours. Once dough is close to being raised, preheat oven to 375°. Bake at 375° for about 15-20 minutes or until tops are lightly browned. Rotate pans to other racks half way through cooking time. Brush tops with butter after removing from oven. NOTE: Lukewarm water is somewhat misleading. You don’t want the water so hot that it burns your hands but if it’s too cool it won’t activate the yeast. About 90-95° is what I recommend. NOTE: You can heat your oven for about one to two minutes and then turn off the heat. Place the cookie sheet with the rolls in the oven covered with a tea towel to allow to raise. If the dough hasn’t raised enough in an hour, remove the cookie sheet, heat oven again, turn off heat, and repeat until rolls have raised successfully. NOTE: I recommend you roll these out at least a half-inch to an inch-thick if you want them to have the proper shape. Otherwise, these are too flat. NOTE: I highly recommend St. Dalfour’s sugar-free jams and preserves also made without artificial sweeteners. They have quite a few flavors and all are wonderful for spreading on bread and rolls. Recipe source: adapted from Gooseberry Patch's Country Baking. Homemade Dinner Rolls don’t have to be kneaded! These rolls raise in the refrigerator. Roll out and place in a warm place and then bake! Amazing recipe. [b]NOTE[/b]: Lukewarm water is somewhat misleading. You don’t want the water so hot that it burns your hands but if it’s too cool it won’t activate the yeast. About 90-95° is what I recommend. [b]NOTE[/b]: You can heat your oven for about one to two minutes and then turn off the heat. Place the cookie sheet with the rolls in the oven covered with a tea towel to allow to raise. 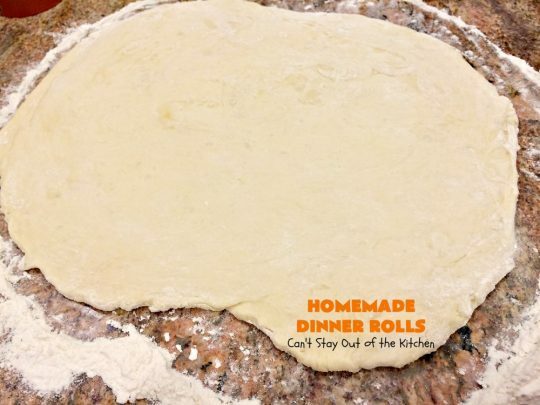 If the dough hasn’t raised enough in an hour, remove the cookie sheet, heat oven again, turn off heat, and repeat until rolls have raised successfully. [b]NOTE[/b]: I recommend you roll these out at least a half-inch to an inch-thick if you want them to have the proper shape. Otherwise, these are too flat. [b]NOTE[/b]: I highly recommend St. Dalfour’s sugar-free jams and preserves also made without artificial sweeteners. They have quite a few flavors and all are wonderful for spreading on bread and rolls. Homemade Dinner Rolls are a great accompaniment to thick, savory chowders like Chicken-Chickpea-Potato Soup. 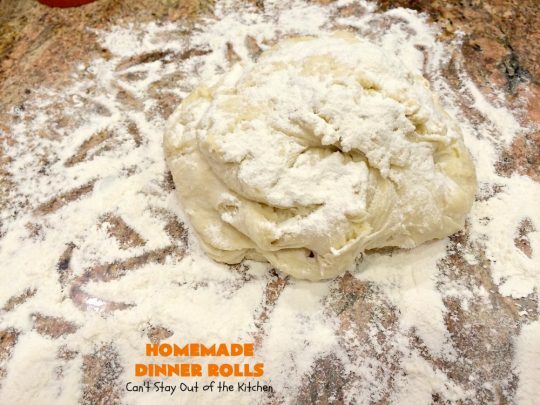 Homemade Dinner Rolls are also a great dinner bread to serve with Paula Deen’s Bacon Cheeseburger Meatloaf which is what we served them with! When Michelle told me she didn’t have to knead these dinner rolls, I wanted the recipe IMMEDIATELY!!! You can also use Homemade Dinner Rolls to make miniature sandwiches like Ham and Cheese, BLTs, Chicken Salad, or other favorite recipes. Hey, and so easy, too! 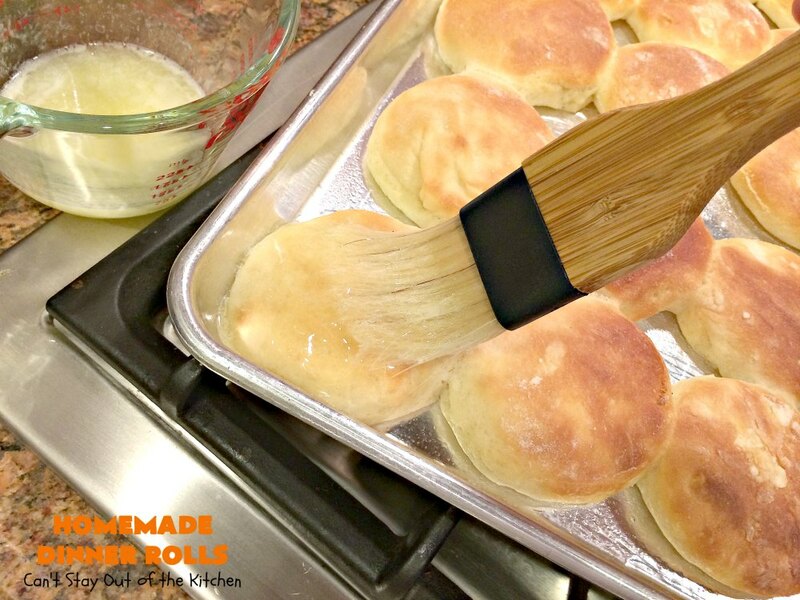 I loved how easy these delicious rolls were.